These are the criteria to meet: Humble Beginnings, Start of Darkness, Greenness, Powers, Relationship to Glinda, and Relationship to the Wizard. 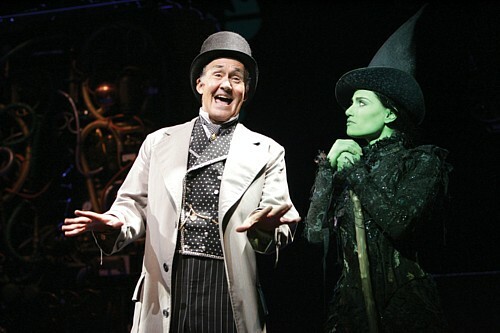 Elphaba Thropp in Wicked is the daughter of the mayor of Munchkinland, but she is by no means privileged. Upon arriving at Shiz University, she is clearly the unfavorite in the family, and mostly acts as chaperone to her younger handicapped sister, Nessarose. On her first day at Shiz, she attracts the attention of Madame Morrible, the headmistress, as a promising student of magic. When she mentions the possibility of meeting the Wizard of Oz, her dreams of “making good” with the powers that have long been scorned take flight. She also comes to learn how the rights of Animals (animals who can talk) are being curtailed, which eventually causes them to lose their powers of speech. She hopes by seeing the Wizard, she can ask him to stop this tyranny. We first meet Theodora in Oz the Great and Powerful when Oscar Diggs, the Kansas conman who will become the Wizard, first lands in Oz. She is a good witch who believes Oscar to be a wizard prophesied to destroy the Wicked Witch (who everyone thinks is Glinda, but is actually Theodora’s sister, Evanora). He charms her and she falls hopelessly in love with him in the span of a night. Zelena in Once Upon a Time has quite complicated past. She is connected to the rest of the Once Upon a Time cast as the long lost daughter of Cora, mother to main character Regina, the Evil Queen from Snow White. Cora gave Zelena away so the child wouldn’t hold her back in her rise to success (yeah, she totally wins Mother of the Year.) Infant Zelena’s powers call up a tornado that whisks her from the Enchanted Forest to Oz, where she is taken in by a poor couple. In the wake of her adoptive mother’s death, her adoptive father treats her poorly and eventually reveals he is not her true father. To find out her past, she seeks out the Wizard of Oz, who reveals what Cora did, and that she had another daughter, one who could give her what Zelena couldn’t – a connection to royalty. The Wizard then gives her a pair of silver slippers that can take her anywhere, which she uses to teleport to the Enchanted Forest. She meets Rumpelstiltskin, and asks him to give her magic lessons so she can prove she is better than Regina. Conclusion: Theodora actually starts out in a pretty good place – she’s a witch, she’s powerful, has a sister she cares about, finds love (with a cad, but still). Zelena and Elphaba, on the other hand, both come from dysfunctional homes, have little sisters who are loved more than them, and have a keen amount of ambition in them to rise above their circumstances, making them somewhat justified for any anger against Oz. But Elphaba, while bitter to a degree, has an earnest hope for the future expressed in her I Want song, “The Wizard and I,” making it hard to believe she will turn sour, while Zelena’s hope is clearly underpinned by a deep resentment (plus, she’s related to two of the most vindictive characters in Once Upon a Time). Elphaba, technically speaking, has two starts of darkness – one in the eyes of the public of Oz, the other in her own eyes. She is first called wicked in the Emerald City. After she is tricked into using a spell in the Grimmerie to create a flying monkey, , Elphaba is horrified, and realizes that the Wizard is responsible for the injustice in Oz. She steals the Grimmerie and, in a spectacular show of power, escapes Oz on a flying broomstick. The Wizard and Madame Morrible discredit her and use her as a scapegoat. Her second turn occurs when her love, Fiyero, is seemingly killed for protecting her. In the wake of her sister’s death and years of watching her reputation ruined, her good actions scorned, she decides that “no good deed goes unpunished,” and embraces her label, at which point she goes after Dorothy for the ruby slippers. Theodora’s start of darkness comes from being taken advantage of not once, but twice. She is so hurt when she sees Oscar bonding with Glinda that her sister Evanora is able to feed her a poison that shrinks her heart (as evil Evanora wants her sister on her side). But the poison works too well, and Theodora is transformed completely into the familiar Wicked Witch of the West, now full of only hatred for Oscar and Glinda. Zelena in Once Upon a Time takes lessons from Rumpelstiltskin and revels in his attention, but is horrified to find that he has continued to teach her sister at the same time. Zelena tries to kill Regina, but it turns out to be a test by Rumpelstiltskin (clearly, she failed). Frustrated, Zelena returns to the Wizard and demands that he take her to the past, to the moment where Cora abandoned her, so she can change it. The Wizard says that it’s impossible to change the past. Zelena, not taking no for an answer, transforms him into a flying monkey, and sets out to find a way to change the past. Conclusion: Theodora’s start of darkness is really sad, but a little weak. Turning evil wasn’t even entirely her choice (though being heartless ensures she never turns back). Elphaba and Zelena are both very similar, both driven by the betrayals of others and their own ambitions. But while Elphaba goes off the edge and goes for the shoes only after a lot of stress (a turn which turns out to be temporary), Zelena becomes dedicated to literally bending the rules of magic to get what she wants. Point to Zelena (but kudos to Elphaba, as her having to deal with the negative press). 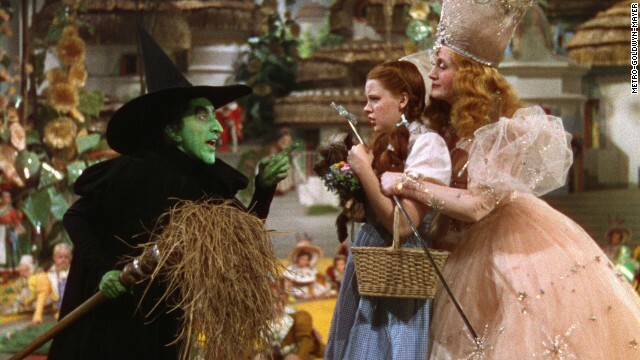 The Wicked Witch’s iconic green skin is an important part of the movie and cultural mythos. So, where did it come from? 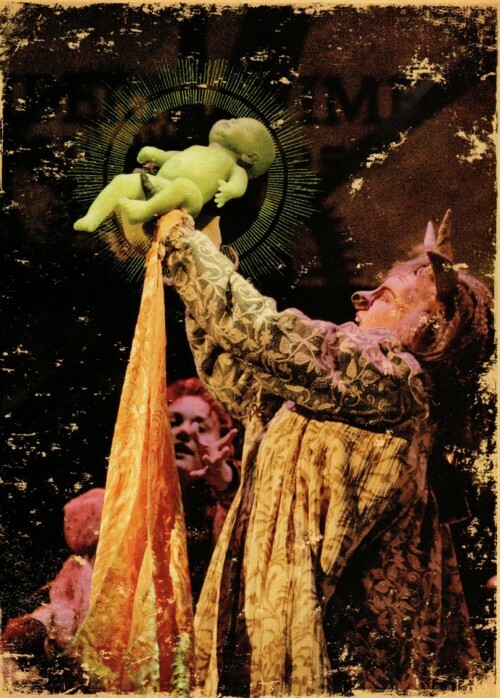 Elphaba is born green, something she is greatly scorned for from the moment she is born, because her mother drank a defective green elixir from the man she was having an affair with when she got pregnant. She learns to develop a tough skin about the comments, but she secretly wishes to become normal with the help of the Wizard. Theodora becomes green through the potion that shrinks her heart, turning her into the witch. Why green? Well, it’s her sister’s signature color, and the poison was given to her through a green apple (maybe a little Snow White?). She was, however, vulnerable to water even before her transformation, as when she cries the tears burn her face. Zelena’s magic turns her green when she becomes jealous. It is unknown if this has happened to any other spell casters in the Enchanted Forest, but Rumpelstiltskin seems familiar with the phenomenon. As her main motivation is jealousy, she remains green while in the Enchanted Forest. It’s a fairytale land – moral lessons tend to be very visual and very literal. Just go with it. Conclusion: Being screwed over by your sister, or a jealousy metaphor gone literal, are not bad reasons for being green. But being born green and having to struggle with that makes for a better character. Point to Elphaba. 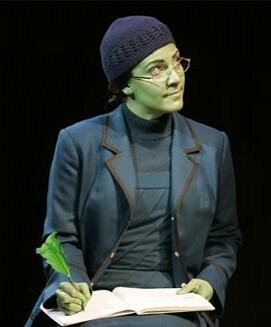 Elphaba within the Oz of Wicked has uncommonly strong magic. As her family is ashamed of her uncontrolled bursts, she has tried to hide it up until her entrance to Shiz. Once there she is a stellar magic student. She is able to read and spellcast from the ancient Grimmerie, make a broomstick fly, give her sister the ability to walk, and even, limitedly, see the future. As Glinda can barely do real magic and Nessarose, the Witch of the East, only casts one spell, Elphaba’s only true rival in Oz is Madame Morrible, a weather witch who is much better than her at manipulating the press. They never have a true magic face-off, but Morrible notes how powerful Elphaba is, so it’s possible Elphaba truly is the most powerful witch in Oz. Theodora is one of the three witches of Oz. She is particularly strong in fire power, as well as telekinesis, but holds back while she is still good. When wicked, her powers are more evident, getting easily through Glinda’s magic barrier. She is, however, ultimately defeated in this film by a charlatan, so hard to say how powerful she is compared to the other witches. Zelena has been casting magic since she was a newborn. She is said to be more powerful than Regina, a powerful spell caster in her own right, and is able to transform multiple people into flying monkeys, resist a powerful memory-wiping curse, and eventually succeed in her time-travel spell, a previously unheard-of feat (though she never gets the chance to act on it). However, when she receives a pendant from Glinda to help increase and contain her powers, it becomes her greatest strength and her greatest weakness – because her magic comes to rely on the pendant is taken, once taken her powers become useless. Conclusion: Hm, this is a tough call. Between Elphaba and Zelena, these are both exceptionally powerful witches, said to have few equals. Elphaba is never defeated as Zelena is, but Elphaba doesn’t show Zelena’s control or willingness to break the rules. I’m going to call this at a tie (sorry, Theodora, you’re not doing well in this evaluation). EDIT: Originally, I thought Elphaba and Zelena were tied for this. But, actually, Theodora’s powers are the closest to the canonical Witch (Elphaba never throws fire, and Zelena’s spells are all tinged green). So, surprisingly, Theodora wins (but in a magic duel between them, she probably wouldn’t). As the Wicked Witch is often seen to be Glinda’s opposite, their relationship is important to elucidate in any Wizard of Oz-related story. In Wicked, the relationship between Elphaba and Glinda takes centerstage (heh, see what I did there?). They meet at Shiz as total opposites, and through a misunderstanding become roommates. But the two bond and become friends. Glinda supports Elphaba in the Emerald City, and almost flees the law with her, but instead stays behind and becomes a figurehead for the Wizard’s government, conflicted as they denounce her friend. Her fiancé, Fiyero, later falls for and runs off with Elphaba, so when Glinda and Elphaba meet after Dorothy is sent off down the yellow brick road, they are terribly resentful towards each other. But when Fiyero is seemingly killed as a result of their scuffle and Elphaba is driven by grief to go after Dorothy, Glinda snaps her out of it (“I mean they’re just shoes – let it go!”). Elphaba, realizing there is no way to get out of this unscathed, gives the Grimmerie to Glinda, urging her to do the good she couldn’t do. 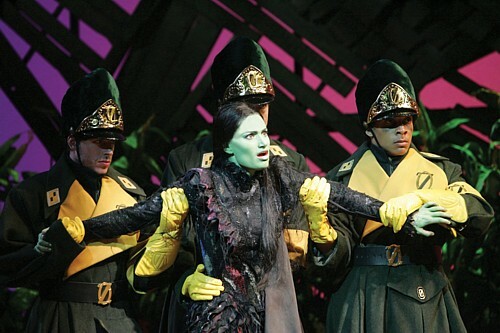 Glinda watches as Dorothy seemingly destroys her friend (*sob*), but becomes a force for good in Oz in Elphaba’s name. Theodora’s relationship to Glinda prior to the events of their film isn’t clear. She seems to believe her sister that Glinda has turned against Oz. But once Oscar Diggs meets the beautiful Glinda, whatever relationship they had is doomed. After her transformation, the only person Theodora hates more than Glinda is the so-called Wizard himself. Other than trying to throw fireballs at Glinda, however, the Witch doesn’t actually have much confrontation with her. In Once Upon a Time, Glinda tells Zelena of a prophecy: that a powerful sorceress would come to Oz in a cyclone, and fill the position of Witch of the West as a powerful protector. She encourages Zelena to let go of her past and join her and her sisters. For a time, things go well, and Zelena loses her green coloring and her hatred of Regina. 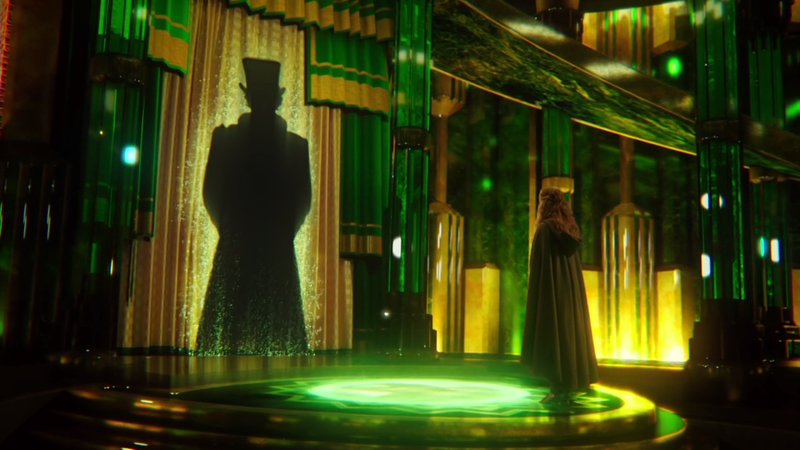 Zelena becomes paranoid that Dorothy will take her place as protector, with Zelena as the prophecy’s “Great Evil.” Glinda tries to assure her that the decision of good or evil is down to her, not fate. But Zelena gives in, and she tries to kill Dorothy. When she fails, Zelena fakes her death and, posing as the Wizard, gets Dorothy out of the picture and Glinda banished to the Enchanted Forest. Conclusion: This is a hard one. I love Wicked’s story of friendship between the Wicked Witch and Glinda dearly. But since I’m trying to best match up with their relations in the The Wizard of Oz … frankly Glinda and the Witch don’t seem as mad at each other as the former Galinda and Elphaba are at that point in the play. Nor does it seem like a girlfriend/really-steamed-ex-girlfriend relationship. Their relationship seems more distant, like Glinda as failed mentor to Zelena. Which is odd, because that encounter never even happens in Once Upon a Time. Still, I think this one goes to Zelena. In Wicked, Elphaba attaches her ambitions to the Wizard early on as the solution to all her problems. When they first meet, he calls himself a fatherly man who only wants to take care of people. But, when he turns out to be the cause of the injustice she is against, she rebels against him, so he accuses her of villainy. When she later returns to his castle to set the flying monkeys free, he once again tries to gain her favor, appealing to her girlhood dreams of being celebrated… until she sees her former professor, an Animal, has also become a victim of the Wizard’s policies, at which point the Wizard and Madame Morrible conclude she needs to be destroyed. After Elphaba’s apparent death, Glinda realizes, through a common bottle of green elixir, that the Wizard is Elphaba’s biological father. Overcome with remorse, he agrees to leave Oz. As stated before, Theodora’s main relationship with the future Wizard of Oz is that of spurned lover. She hung all her hopes on Oscar Diggs, and he turned out to be a fake. He managed to become a good man, while she became a Wicked Witch. Notably, at the end of the film Oscar looks incredibly guilty for what he did to her, and how she has changed, so how he changed from that into the man who ordered her death is a mystery. Like in Wicked, the future witch of Once Upon a Time goes to the Wizard as a young woman for help with a problem, only to find he is a fake. She then turns him into a flying monkey for revenge. This dynamic between the witch and Wizard is disappointing – it is so short-lived, and uncomplicated. Also, the Wizard’s name is Walsh. Walsh. Conclusion: Theodora’s connection to the Wizard actually comes close to winning this one… except the Wizard ordering a kill against her in The Wizard of Oz doesn’t make much sense. Additionally, this backstory feels too much like Anakin Skywalker’s (an immature love causes an otherwise kind, powerful person to be influenced to bad) to be truly meaningful, at least for me. But a pseudo-father-daughter relationship fraught with power struggles that turns out to be an actual father-daughter relationship? Now that’s interesting. Point to Elphaba. So, overall, Zelena in personality comes closer to being the Wicked Witch , despite that she never lives the Wizard of Oz story in its most familiar incarnation. Though it’s interesting to imagine the Witch as a misunderstood activist, Elphaba is a bit too nice, her dark turn too temporary. Theodora is magically forced into it, clearly cast as the Witch for the shock value (since her sister was heavily implied to be the Witch up until that point). I will argue to the grave, however, that Wicked, as a work, is the superior one. But that’s a post for another day. Look for a new post next Monday. Learn more about the blog here, about me here, and resources here. Check out the links for related works and Pinterest boards, particularly my October 31 Days of Villain board, and leave a comment to let me know if you have any thoughts or ideas.